Clustering thicket-forming, very short-stemmed apparently hapaxanthic palm, with stems rarely more than 2 m tall, ± stemless in vegetative state. Rosette leaves ecirrate to about 4 m long with petiole to 2.2 m; sheaths pale greeny brown armed with scattered black spines to 3 cm long and chocolate-coloured indumentum; knee absent in rosette leaves. 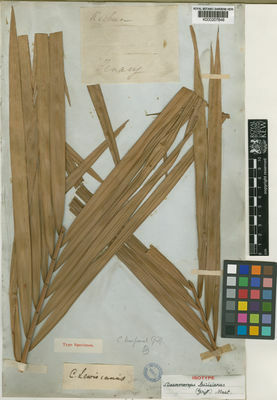 Leaflets about 80 on each side of the rachis, regular, rather narrow, the largest to about 45 cm long by 1.5 cm wide, sparsely armed with bristles on the 3 nerves above, along the margins, and on the main nerve beneath. Sheaths of flowering stem with slight knee, armed as other sheaths. Upper leaves short, rarely more than 40 cm long including a cirrus to 15 cm and petiole to 10 cm; leaflets about 15-20 on each side. Inflorescences decreasing in size from below upwards, the lower inflorescences about 15cm long by 7 cm wide, the uppermost to 5 cm long by 1.5 cm wide; beak varying from about 2-7 cm long. Outermost bract enclosing all the others, with black spines to 3 cm long by 3 mm wide in lower inflorescences, in upper inflorescences almost unarmed; bract often densely chocolate-coloured indumentose. Ripe fruit rounded or somewhat oblong about 2 cm in diameter covered in 15-16 vertical rows of scales, bright green, later turning yellowish brown to cinnamon brown, variously with pale or dark margins. Seed rounded about 1.2 cm in diameter. Endosperm deeply ruminate. Kedah, Penang, Perak, Johore, Singapore. Sumatra.